The Dairy farm was situated on "2e rang" at Gentilly. From 1960 to 1970, he delivered raw milk from his own herd. All the family was working to make the business running (Mr. Piché, his spouse, his kids and his younger brother). The bottles were not identified to the dairy but the caps were. 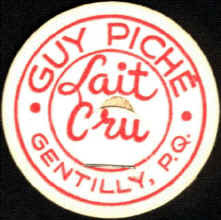 When pasteurization of milk was imposed, Mr. Piché decided to become distributor for Crémerie Union of Trois-Rivières. In 1972, he sold his milk route ot Mr. Poisson.